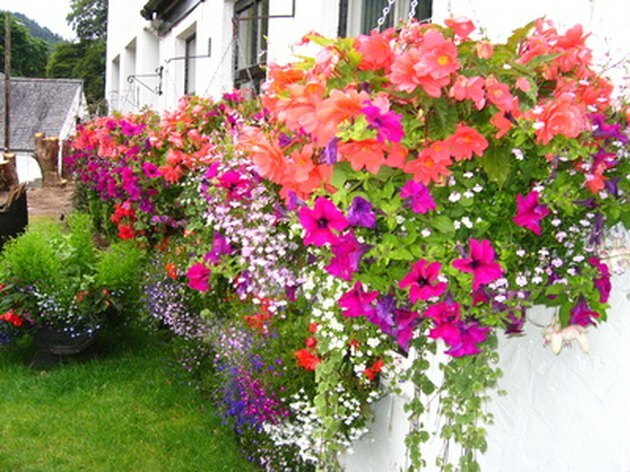 Flower boxes, also commonly called window boxes, are one way you can bring the garden inside to your home. However, flower boxes often require drilling into the studs of your home. This is not an option if you have vinyl siding that is easily cracked and tough to repair, and it's definitely not an option if you rent your home. The solution is to shop around for the gadget that works for you. Window boxes display flowers outside a window. Purchase a window hanger for your box. Most window boxes are designed for mounting to a window with screws, so you'll have to shop around for a specialty window box that comes with hangers. To mount the window box, place the top of the hanger over the window sill, letting the large bottom part of the hook hand down. Place the flower box on the hook. Purchase vinyl siding hooks if you have vinyl siding. The hooks slip in the cracks of the siding and do not require drilling. To use the hooks, slip the top ends of the hangar securely into the cracks in the siding. The hooks can be purchased from most major home improvement stores and hold about 12 pounds per hook. You'll need to check both the weight limit on the package and the weight of your flower box (filled). Consider installing boxes on balcony or stair railings instead of a window. Purchase window box hangers from a hardware store that attach to your railing securely.